This sticker labeling machine is utilized for labeling round ampoules, vials, and many other round shaped objects. Hence it is also referred as ampoule labeling machine. It is very sturdy, highly user friendly and virtually maintenance free. This SBRSL-300 model also includes an advanced micro processor controlled label dispensing system and a sensing system for labels and products. The machine has the capability to label maximum 300 products per minute, based on the product and label size. It even incorporates a specially designed mechanical and electronic system for applying transparent / no look labels on ampoules and vials, at a very high speed using an optional label sensing system. 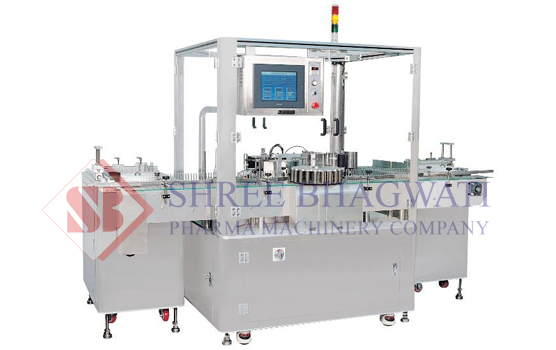 This is the only high speed rotary sticker labeling machine in India, with a distinct single point synchronized speed control system. Hence it has the highest installation in India. The inherent, preset label length detection system helps to eliminate the manual feeding and storage of label length details in the memory and retrieving the same data, every time for changing the label size and restarting the equipment. It thereby, saves your time, prevents machine down time, and assists to increase the production. The other salient features include, the exclusive feeding device for ampoules and vials in vertical position directly from the trays; and also collecting the labeled products similarly in a vertical position in the trays. Moreover the user can even feed the ampoules/vials online for labeling without stopping the equipment. This latest feeding system thus eliminates the inconvenient and lengthy method of labeling ampoules/vials at the time of loading the products. It can be supplied with an online, linear packing line for vials that can be directly connected with the capping machine or turn table for constant feeding. This model is also available with an optional tough acrylic or glass safety cabinet.